Apothecary Deluxe is a feast of shape and symmetry with a wavy chevron pattern creating ripples of color behind a framed arabesque-shaped white panel. The visual effect is striking but harmonious - drawing attention to center stage, where your text steals the show! Set in high-contrast black type, the fonts for Apothecary Deluxe have strong individual appeal and they look great in combination. The largest bold caps are subtly distressed, like turn-of-the-century wood type. A thick italic mirrors the subtle sway of the chevron pattern, a classic serif adds a touch of friendly formality and a retro all-caps font is printed at a slight slant in red ink, as though rubber-stamped by hand. Apothecary Deluxe is offered in a palette of 28 lavish colors: lights, darks, brights and neutrals - all ready to customize for your product, business or special event. Customize your Apothecary Deluxe milestone birthday coasters today to create a unique, unforgettable reminder of the occasion! 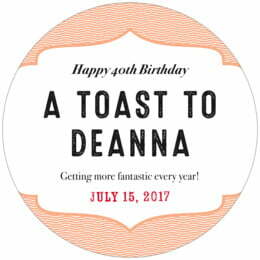 Apothecary Deluxe milestone birthday coasters are available in multiple shapes—3.9" round, 3.9" square with rounded corners, and others. They are extra-thick, 58-point paper board. To give you an idea of how thick they are, a stack of a dozen coasters is about 3/4" tall. They are made of absorbent pulpboard to help protect your tabletop. The coaster surface is coated with a smooth matte coating to provide beautiful, crisp printing. 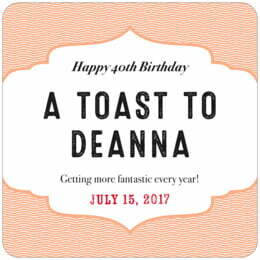 Milestone birthday coasters are individually die-cut, so their top has a soft and rounded edge. They are designed to be disposable, but they are durable and re-usable. 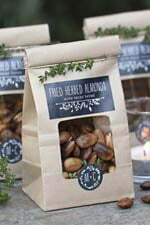 If unused, they can be set-aside as keepsakes and will last forever. These are working coasters; they are designed to be used at your birthday party, outdoor picnic, family party, etc. When spilled on, they will absorb liquids, and it will leave marks on the coasters. Milestone birthday coasters are printed on one side only. On the blank back, a small Evermine logo is tastefully debossed (not printed with ink, but simply pressed into the soft pulpboard paper). Evermine milestone birthday coasters come beautifully packaged in boxed sets of a dozen; they are as good to bring as a surprise gift to a party you are attending, as they are if you are the host, and you simply hand them out to your guests or scatter them on your tabletops.